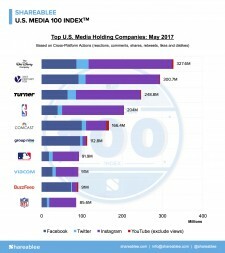 New York City, NY, June 20, 2017	(Newswire.com) - Shareablee, the leader in social media measurement, today released the U.S. Media 100 IndexTM monthly ranking for May 2017. The Walt Disney Company maintains its #1 position with 327.6 million consumer interactions, making up 10.5% of total engagement within the media industry in the U.S.. TWDC also saw 33% growth in content shares and 22% growth in video views. Twenty-First Century Fox Inc. took second spot with 300.7 million interactions and strong growth of 10% in content shares. Turner Digital ranked third overall with 248.8 million interactions, but won in video engagement - driving 158.6 million consumer interactions. 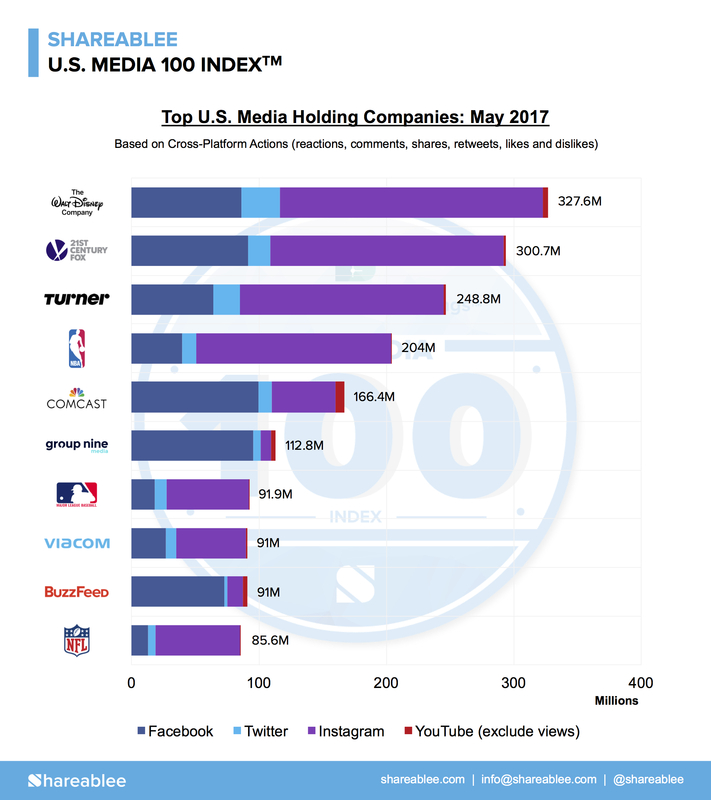 Group Nine Media led the U.S. Media 100 index in video views, with 2.9 billion views, making up 9.6% of the industry’s total views. BuzzFeed’s roll-up which includes Tasty, Nifty and BuzzFeed video followed with 2.4 billion video views. Haymarket Media saw the fastest growth in May, with a 143% increase in total interactions driven mostly by their increase in video content. First Media followed with 76% growth in total actions and 100% in shares, climbing the list to #25. Shareablee is the leader in audience-based social media measurement for media publishers, agencies and brands that want to understand the impact and effectiveness of their cross-platform social media campaigns. Shareablee captures the real-time social media actions of more than 2 billion consumers and parses them across 700+ metrics into its global taxonomy of over 475,000 brands, publishers, TV shows, influencers, and celebrities going back to January 2013. Shareablee was founded in 2013 by Tania Yuki. Based in New York City, the company has grown to over 60 employees in U.S. and EMEA offices and has clients in 15 countries. The company partners with Facebook, comScore, and Bloomberg. Shareablee is a Facebook Media Solutions partner and one of only 15 companies globally developing on the Facebook Audience Insights API. Shareablee’s roster of platform clients includes the National Basketball Association, WWE, Warner Bros, ESPN, Hearst, NBC, AOL, Coach, Comcast and leading global advertising agencies Publicis, WPP, Maxus, and Omnicom.